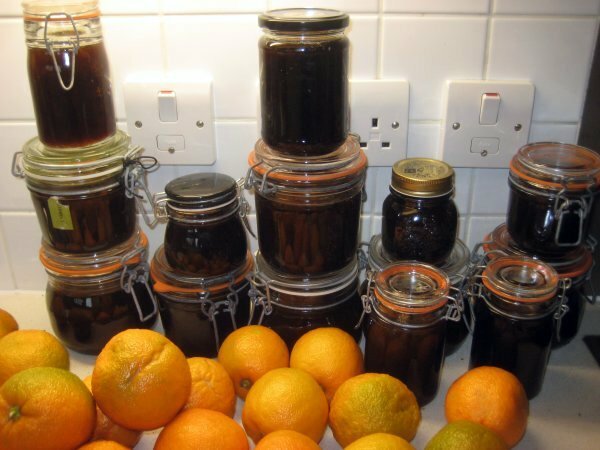 The new year and one of my first thoughts is not on gardening but on marmalading. 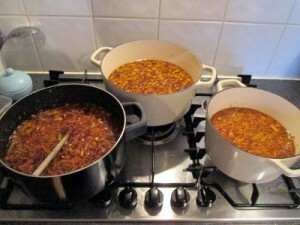 It’s often too cold to be outside, and nothing beats the sweet fug of marmalade cooking on a stove in midwinter. In Europe, this is the only month of the year when you can buy Seville oranges; the only fruit for perfect marmalade. 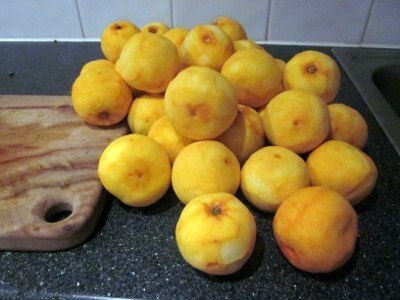 I have strayed into other citrus for fun; ruby grapefruit marmalade, lime marmalade, and my first ever jam – made when I was 16 from a fruit I picked from my friend Sammy’s parents garden – kumquat marmalade. I couldn’t believe it worked to be frank. I suspect it was more caramel than jam. And I gave the only jar the fruit yielded as a gift to Sammy. She reminded me of this event on my last visit to Sydney. I had forgotten all about it. From small beginnings do careers begin. And thus started a life time of making jam and giving it away. Or in my more recent years, selling it at a London Christmas Fare. And people start lobbying early to be on the list for the marmalade. That’s not a boast. It’s just that I now make so few jars. In previous years I was a relentless marmalade factory. And I blame Stephanie Alexander for this. What a wonderful cook. An inspiration, and the writer of the one cookbook (and the only one) I would grab from my library were the house on fire and I had but a second to act. It’s The Cook’s Companion, a tome. A brick. A gift from my mother and the only book I really ever consult when I am stumped for a recipe and the internet is not at hand. 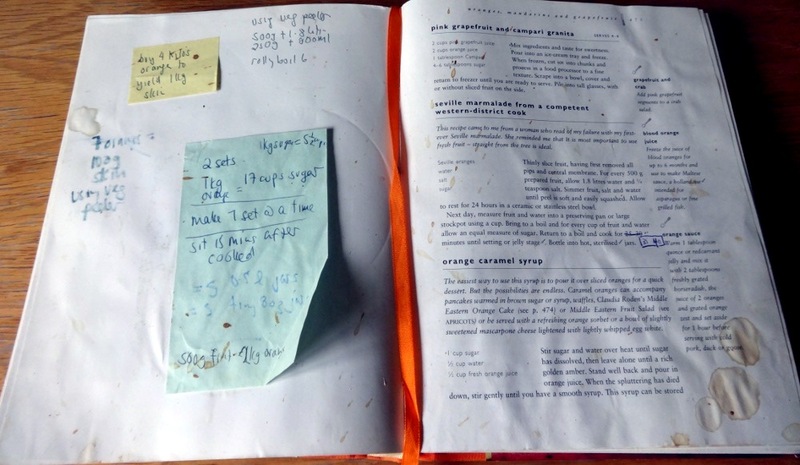 The page falls open to marmalade. Spotted, covered in drips, written notes, remarks about how long the jam actually takes to cook. That’s what cannot be replicated when you seek electronic ideas for things to cook. No, wait, that’s what I’m doing here. Sorry to offer a bit of post- modern irony and all that. But at least I can show you a photo of my old life – the looking up in a book life. The one where you never lose a recipe because it’s on the shelf. The problem was the recipe is perfect, but labourious. 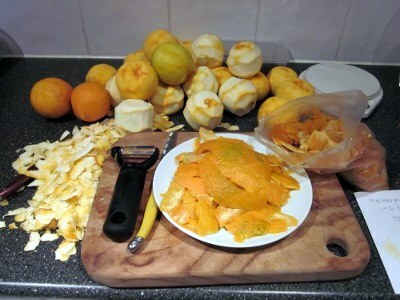 I found myself peeling the oranges with a vegetable peeler just to make sure I didn’t get the bitter pith. I did this for years. And there is no way you could actually explain to the toast and marmalade crowd just how many hours it took to make the darn thing. So last year I rebelled. I decided that fussing about whether or not a marmalade is extra bitter is ridiculous when you are getting stuck into a mouth-puckeringly bitter and sweet concoction that will blow the back of your taste buds off if you eat it neat out of the jar. Frankly, I loathe the stuff. I can’t be having that much of a sugar rush on my toast of a morning. Give me cheese on toast any day. But it is a culinary treat. And there are fans. And my trick is to substitute a lot of the white sugar called for in both recipes with dark brown sugar. It gives the marmalade a more unctuous caramel flavour, closer to the Cooper’s Oxford stuff, but without having to cook it so long you create a true caramel, or burn the entire batch and have to start again. Did anyone notice I had tinkered with the recipe? I have not heard complaints. And it’s possible I can go back to making mountains of the stuff as I don’t now lose a week of my life finely peeling the pith. 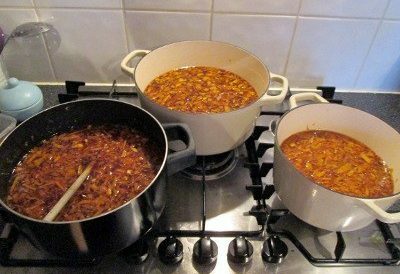 But in honour of Stephanie’s recipe – Seville marmalade from a competent western-district cook – I do let the peel soak overnight. 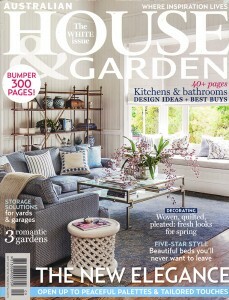 This recipe is an adaption from Stephanie Alexander and Maggie Mayhew (Jams, Jellies and Marmalades). 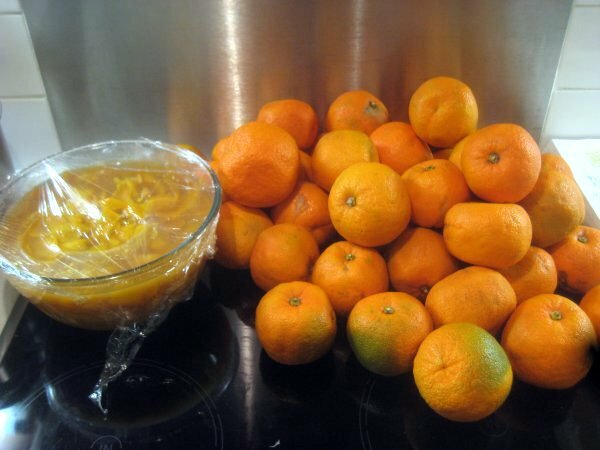 I find it best to make one set of jam at a time; start off with buying two kilograms (about 4.4 lbs) of oranges, but when it comes to the jam making measure out only half of the batch and add the sugar. Cut the oranges in half and squeeze out the juice. Reserve the juice. Thinly slice the orange skin, trying not to get too much pith. (Fanatics can use a vegetable peeler). For every 500 gram (1.1lb) of sliced peel allow 1.8 litres (60 fluid ounces, 7 ½ cups) liquid. I make this up of the juice of the squeezed oranges and water. Simmer the fruit and water and juice in a large saucepan with a tight fitting lid until the peel is soft and can be easily squashed with your fingers. You don’t want too much of the steam escaping as it forms part of the marmalade making process later. Leave it aside overnight to rest. The next day place a saucer in the freezer to test your marmalade set, and sterilize your jars, lids, ladle and funnel by putting them through a dishwasher cycle while you cook the jam. Measure the fruit and liquid into a large saucepan with your cup measure. For every cup of fruit and liquid allow an equal measure of sugar. I use half and half granulated sugar and dark brown muscovado sugar. No guess work here, it’s safest to write down your quantities and count the cup measure carefully. Stir well, bring to the boil and cook for around 35 minutes until it sets. Take care when you are pouring the marmalade into your jars that your distribution of fruit is even. Otherwise some will be chewing their way through too much peel while others will think you’ve served them marmalade jelly.